Oh, by the way...I've consistently counted ten little birds. 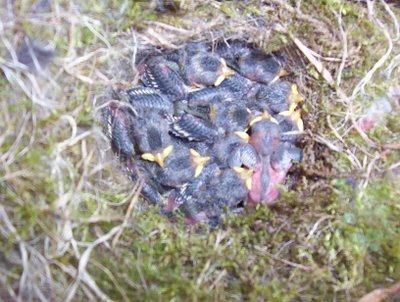 I don't know if there is an eleventh sneaking in some warmth under the others, or if only ten birdies hatched. But I'll letchya know. I'm glad humans have more time with their parents before they leave their home :). That picture made me smile! Thanks, I needed that! Oh my gosh...What a brood!!! I am so impressed that those little birds can feed that many mouths. Their beaks still look too big for them!! I'm so glad you are still there to keep watch over them. One of God's amazing little creations. Thanks for my daily "warm fuzzy". It's amazing how strong something so small can be. Wow, and I thought our place was crowded! They sure are packed in there!